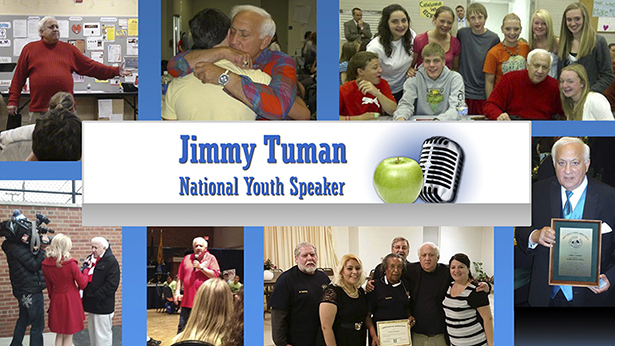 DS: I’m here with Internationally-renowned speaker Jimmy Tuman. Jim, you have a very important role in the nationally-released movie produced by the Radish Group in Royal Oak, Mich. called “A Girl Like Her.” Jim, tell me why you think this movie is important. DS: That’s so important! Jim, talk a little bit about your role in the movie. JT: I’ve been a national speaker for 35 years and talked over 2 million kids in more than 2000 schools. When I first started speaking, the one ingredient that I talked about, in the earlier question, is “how can I help kids feel safer.” Part of that ability is for kids to be able to have a voice in their school. My exchange in the movie is basically asking a very predominant question that I ask in my keynote, which is “how many of you feel safe to go to school every day,” and “raise your hand, if you have a best friend, and tell me what makes that person a best friend, to you.” The key to “best friends,” is the ability to be yourself, and not to be judged or put down or hurt by your friend. Using that as a model, schools can discover how to create that “best friends climate.” I use the word climate because I feel that is the biggest challenge for schools these days, to create a climate of acceptance, of support, of caring. I call it “safe, valued, loved.” Every school wants their young people to feel safe, valued and loved. DS: Do you talk about that in the movie? JT: My part in the movie was a speaker – in the environment of the movie –- and so I interact with my audience. The scene was shot at in a high school auditorium. I interacted with my audience and tried to draw them out and ask them questions, that would be pertinent to the movie itself. DS: So, since you are – in reality – a speaker, it’s kind of like “art imitates life imitating art,” in a way? JT: That may be more of a simplistic synopsis of it, I think it’s more important that people be able to, think in terms of stepping into the shoes of kids, and discovering – in those shoes – how they can best support kids, as educators or as a parent. DS: The reviews I’ve read have referred to the movie as more of a “mockumentary,” because it uses this technique of employing technology, by the person that’s being bullied, to be able to record those episodes – and to use those recordings as a way to build a case against the bully. JT: I encourage everyone to see this movie. When you see the movie, you will see how everything unfolds and, in many cases, you’ll see a “modeling” that is going on. The modeling of the girl that is the bully, the modeling of her parents. You’ll see, without giving away the movie, the key to this is understanding the source, for many of the bullies. For many of the bullies, the source is basically about them, not feeling valued themselves, so all they do is bring other kids down to the level that they feel. I designed a poster about bullying, that says: “No matter who you are, no matter what you do, there will be people that like you, and people that dislike you. There are going to be people that love you and there are going to be people that hate you, and there are going to be people that are indifferent.” The most important thing of all, is “it’s never about you,” it’s about them. So if you understand the resource that the movie provides, then you can get to the solution! If you don’t understand the source, then you’re fishing all the time, and you’re guessing. We’ve been guessing for too long in our history, and were guessing wrong, because bullying is still as prevalent today, as it was 50 years ago. JT: This movie creates hope. If you watch the movie and don’t take it just as a “movie that you go to see, walk out, and life is the same,” then you won’t get the whole impact of what the movie was designed to do. After viewing, when given the chance – in the days, weeks and months later – create a dialogue over this, and look for ways to make a better climate in the schools environment. Then, the movie will have had way, way longer value, than most movies. DS: That’s important – to talk about those situations – and not sweep them under the rug, or stick them in a closet, but to really dialogue, as you say. That’s an awesome thing that the movie deals with. Is there anything else Jimmy that you would like to say before we wrap up? JT: Again, I want to reiterate – go see this movie. Many of you will see yourselves, in the various scenarios. By seeing yourself, you will gain much more than just reading about it, or just having seen it on the news. It will take a real “living and breathing” shape in your life. It will act as a mirror for what you went through, and, in identifying through what’s in that mirror, it will give you more insights to help support your children. 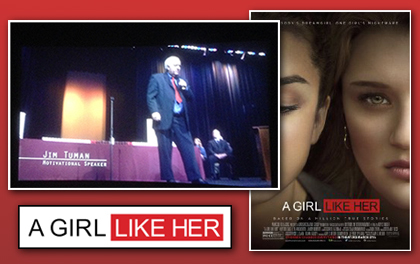 DS: Well, thank you Jimmy Tuman, we encourage everyone to see “A Girl Like Her,” an AMC independent release, at your local theaters. JT: Thank you, for some very insightful questions. *49 States have Bullying Legislation in place, making inappropriate bullying activities subject to prosecution in a legal court of law. Part 1 of a 3 Part Series titled “You Are Not Alone.” These insights on life will touch your heart and inspire you to live the fulfilled life of your dreams. Over my 30 years as a national speaker, I have watched the age-old concept of bullying in schools reach new dimensions, in not only true form but Internet as well. This culminated recently when I received a call from the parents of a six year old who had taken her own life because the kids were picking on her at school. I remember the feeling of frustration, hurt and anger when I hung up the phone that day. I have developed a model for schools and communities to be more pro-active in their approach to create a safe school environment. I was invited by 14 world leaders to demonstrate this model. I believe schools these days can no longer do it alone and they must create an environment where students feel safe, valued and loved. Please contact me anytime for specifics on my approach. I look forward to working with you.